Sunstone Spa’s Rose Massage delivers both energy and relaxation this month. Chocolates and flowers are sweet treats, but either they last too long (calories!) or not long enough (droopy petals!). During the month of May, the best and most loved gifts are those found within the sparkling walls of the desert’s top spas —scrubs, massages, wraps, facials and mani-pedis to polish, de-stress, beautify, and provide a heaping boost of self-confidence as summer gets underway. Sunstone Spa at the Agua Caliente Casino Resort Spa celebrates May luxury with roses, diamonds, and gold incorporated into a trio of specials. The Rose Maroc Scrub features rose maroc, a highly sought-after essential oil from the centifolia rose grown in Morocco, along with fossilized desert salts to exfoliate skin and create a feeling of energy. For a double helping of rose energy, follow with the healing, hydrating Rose Massage. Add on the Collagen Face and Neck Treatment, featuring collagen-rich masques customized for different skin types and infused with either diamond powder to brighten skin tone or Nano gold to repair and rejuvenate. Rock Spa at Hard Rock Hotel Palm Springs is highlighting its Everglow package, which includes the Sweet Tea Body Scrub, Synchronicity Massage with agave body oil, and final moisture application of coconut-lime body milk. Featured spa products are by Farmhouse Fresh, a natural and organic bath and body line. The Spring Resort & Spa’s staycation Spa and Shop packages for May through June include overnight lodging in a deluxe poolside king with two Swedish massages, a $50 gift card, and a VIP coupon book for nearby Desert Hills Premium Outlets. Guests can enjoy the resort’s three mineral pools, grounds, and Finnish sauna before or following spa treatments. The Ritz-Carlton Spa is also focusing on moms this month with its Mother’s Daydream package — the 80-minute Ultimate Radiance Facial followed by the 50-minute Relaxation Massage to rejuvenate tired-looking skin and melt those pesky neck and back knots with aromatherapy and essential oils. For expectant mothers, the Pampered Mom-To-Be package starts with an 80-minute gentle massage and winds up with a 50-minute Custom Facial to cleanse, hydrate, and add a radiant glow. 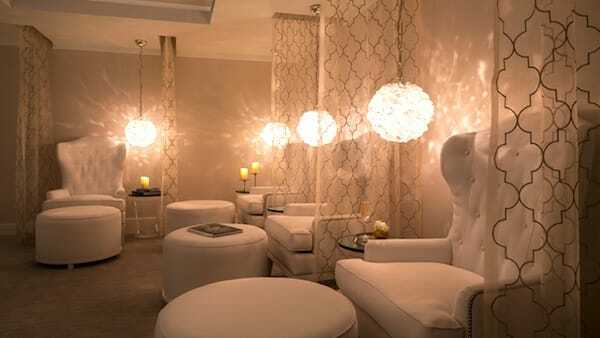 The lounge at the Spa at the Ritz-Carlton is a glamorous, girly oasis. The Well Spa at Miramonte Resort & Spa has four specials lined up for May. The Spring Splendor Massage utilizes relaxing scents of cucumber, blood orange, grapefruit and lily of the valley blended into coconut oil and Vitamin E for a refreshing, lightly moisturizing treatment. The Revitalizing Cocoon starts with a creamy scrub to whisk away dry skin and a slathering of cleansing mud to kick-start circulation inside a warm body wrap, then finishes with an allover body butter application. The Hydrating Facial features Sciote Skin Care’s stable, bio-available Vitamin C to stimulate collagen production, refine skin texture and reduce the appearance of tiny lines and wrinkles. Finally, a deluxe Mani/Pedi includes an Epsom salt soak, exfoliation with fruit extracts, shea butter mask and pretty summer-ready polish. Studio M’s Spa Retreat delivers a full serving of relaxation with an hour-long Custom Massage, hour-long Custom Anti-Aging Facial, and a Spa Manicure and Luxury Aromatherapy Pedicure with the salon’s high-end, organic, and cruelty-free polishes.